In birds, several kinds of infectious diseases can occur. It is important to take notice of any disease in an early stage. Most infectious diseases won't heal by themselves, you should take your feathered patient to a vet as soon as possible. 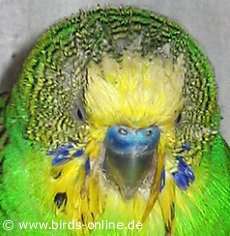 In this section of Birds Online you can find some information on infectious diseases that are typical for budgies and other pet birds. There is a wide range of possible diseases. Quite often, budgies for example suffer from vomiting as you can see in the photo on the right. When people talk about a "sour crop" because their budgies throw up their food, this is not quite exact. Several diseases such as avian gastric yeast can lead to the symptom vomiting. Also diarrhoea and kidney problems are often confused since the bird's droppings (faces and urine) are excreted from the cloaca. As you can see, it's highly important to contact an avian vet or at least a small animal vet who is used to treat birds. Else a sick budgie will most probably not survive the disease.